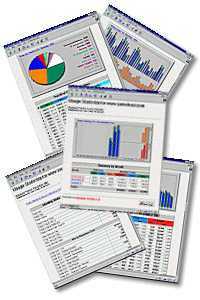 A complete set of a business plan includes a business plan in printed form and on diskettes in electronic form (programs in Word and Excel with the capabilities of calculations and graphing). Such a kit gives a complete picture of the planned enterprise and shows all the thoroughness of the work done to develop a business plan. The cost of a complete business plan is about 2,000 euros, depending on the type of proposed activity, the complexity of the preparation and the amount of project funding. At present, customers who have ordered a complete set are offered to make a FREE website of your company, similar to this website, on the Internet. In addition, your advertising throughout the year will be FREE posted on the portal. The set of materials for self-drafting a business plan includes a real sample of the business plan in your field of activity and recommendations for its preparation, as well as 10 hours of free consultations. The cost of a set of materials is 200 – $ 300. Advice on drawing up a business plan. The cost of 1 hour of consultation – $ 10. Experience in developing business plans – 5 years (production, services, travel business, web business). Doing myself 3 years in web business. The quality of the business plan and confidentiality of information is guaranteed. All customers who have ordered any services are currently offered to place a banner with their ads on the portal for FREE. Consultations for small business entrepreneurs. A well-written business plan is a guide for a novice entrepreneur. The business plan should have a well-defined business idea, and its implementation. If necessary, the business plan must convince potential investors before the company becomes profitable: each creditor is primarily interested in returning his money. Drawing up a business plan reduces the risks associated with entrepreneurship and often helps to avoid unpleasant surprises that the start-up entrepreneur can take over: something important has gone unnoticed or some of the costs have not been taken into account. If a business plan already written on paper shows that the planned entrepreneurship is not worth starting, then the entrepreneur should not have the thought of making expenses and start implementing a business idea that will not bring profit to the owner. To draw up a business plan, there is no exact form that all entrepreneurs would have to use without fail. The following review materials are an aid to facilitating the work of a novice entrepreneur in drawing up a business plan. Below are the main points that should contain a business plan. All customers who have ordered any services are now offered to place a banner with their ads on www.web1.info for FREE.